Cloth diapers, in a more modern form, are definitely making a comeback! If you are pregnant or have a baby, and are considering the pros and cons of both disposable and cloth diapers, you will want to know a bit more about each. Here is a list of pros and cons of sposies and cloth, written by someone who used both. Because disposable-diaper users are still in the majority, and buying Pampers or Huggies seems to be the "default" these days, we'll tackle sposies first, and look at their pros and cons. Then, we'll put cloth diapers under the microscope. You can throw them away after one use, and don't have to worry about the clean-up. They absorb a lot of fluids. They are very thin when empty, and hardly noticeable under a baby's clothes. Most baby clothes are made for "thin" diapers. You can buy them in all different sizes, almost anywhere. They take a very long time to disintegrate around 500 years in a landfill site! They cost quite a bit of money. You have to go to the garbage collection point all the time, to dispose of used diapers. They contain an awful lot of chemicals. You never run out! 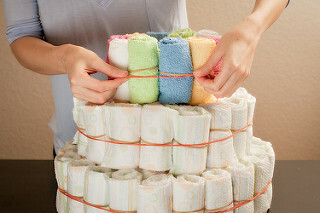 You can even use the same cloth diapers from birth to potty if you get one-sized diapers. They encourage parents to change diapers more frequently, lessening the risk of diaper rash. They can look beautiful, and don't smell unless there is something in them. Children tend to potty train earlier with cloth diapers. You have to carry wet diapers with you in a diaper bag when your baby needs a change and you're not at home. Some cloth diapers have a learning curve. You will have a sizable amount of laundry. Once your baby starts solids, you will need to wash poop out manually before putting the diaper in the machine. They are expensive to buy initially. When does a newborn's cord stump fall off? Comments and reviews on article "Baby Bathing Basics: First-time Parents Guide to Newborn Baths"
Diaper rash, What to do? Should I force my daughter to use potty?